Ever since Adam and Eve, mankind has been entrusted by its Creator with the care and stewardship of the created world. That simple command from Genesis 2:15—to ‘till and keep’ what is fittingly called a garden—is the obvious starting point for Pope Francis’ new encyclical on the environment (climate change being just one topic among many). But Laudato Si—taken from St. Francis’ creation-inspired hymn of praise to God—invites us to go deeper than this. The pope begins with the dignity of the human person, recalling that man and woman were made in the image and likeness of God as stated in Genesis 1:26. This fact is the foundation of the Christian teaching on the inviolable dignity of each person, which Francis repeats in Laudato Si. Hence we must say that the distinction and multitude of things come from the intention of the first agent, who is God. For He brought things into being in order that His goodness might be communicated to creatures, and be represented by them; and because His goodness could not be adequately represented by one creature alone, He produced many and diverse creatures, that what was wanting to one in the representation of the divine goodness might be supplied by another. For goodness, which in God is simple and uniform, in creatures is manifold and divided and hence the whole universe together participates the divine goodness more perfectly, and represents it better than any single creature whatever (Summa Theologica, Part 1, Question 47, Article 1). Francis is quick to clarify that this is not to put other creatures on the ‘same level’ as human beings (paragraph 90). But it also means that we cannot treat the rest of the earth and its creatures as mere objects for our dominion (82). Every created thing, he says, has worth and value: nothing is disposable (84). This is an ecological truth in the sense that smaller creatures like bacteria and algae are important to the health of a habitat. (“But the good functioning of ecosystems also requires fungi, algae, worms, insects, reptiles and an innumerable variety of microorganisms. Some less numerous species, although generally unseen, nonetheless play a critical role in maintaining the equilibrium of a particular place,” 34). It is also a theological truth. Here Francis is again building on a Thomistic principle (see Part 1, Question 92, Article 3, Objection 2). As persons created in the image and likeness of the God who is love, we have the capacity to love our fellow man and woman, who are also themselves worthy of our love being themselves image-bearers of God (65). As Francis puts it: “For all our limitations, gestures of generosity, solidarity and care cannot but well up within us, since we were made for love” (58). Fraternal love can only be gratuitous; it can never be a means of repaying others for what they have done or will do for us. That is why it is possible to love our enemies. This same gratuitousness inspires us to love and accept the wind, the sun and the clouds, even though we cannot control them. In this sense, we can speak of a ‘universal fraternity’ (228). Such a conviction cannot be written off as naive romanticism, for it affects the choices which determine our behavior. If we approach nature and the environment without this openness to awe and wonder, if we no longer speak the language of fraternity and beauty in our relationship with the world, our attitude will be that of masters, consumers, ruthless exploiters, unable to set limits on their immediate needs. By contrast, if we feel intimately united with all that exists, then sobriety and care will well up spontaneously (11). 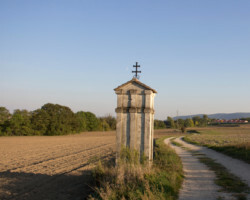 There is thus a certain communion we enjoy with nature—what Francis variously terms a ‘sublime communion’ and ‘a splendid universal communion.’ This communion, Francis writes, is oriented towards God. Just as we are not lords over nature, so also nature is something we worship as an end in of itself. Both instead have their purpose and being in God. Both man and the bodies and elements of nature are, after all, worshipping God together in St. Francis’ hymn. The universe unfolds in God, who fills it completely. Hence, there is a mystical meaning to be found in a leaf, in a mountain trail, in a dewdrop, in a poor person’s face (223). This doesn’t mean, of course that the ‘finite things of this world are really divine,’ Francis says. Instead, as St. John of the Cross explained, we sense God in creation because of the ‘intimate connection between God and all beings’ (234). Such intimacy was at its greatest in the Garden of Eden, where no clothing nor manmade homes were necessary for the well-being of man, who was in full communion with nature. It was in such a state that man was originally in communion with God as well. In showing respect for nature today, then, we take one more step towards the full restoration of that state of original happiness. This is the ultimate message of Laudato Si.